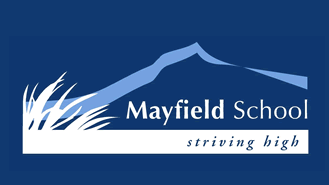 Mayfield School is a decile 7 co-educational state full primary school (U2 grade) catering for New Entrants to Year 8 students. In August 2017 our roll was 70 students. Mayfield is a rural community in the foothills close to the Southern Alps on the edge of the Canterbury Plains. We are surrounded by mountains, notably Mt Somers, Mt Hutt, Mt Peel and Surrey Hills. These form the names of our four House Groups we run at school and give us our local identity. We are a four-classroom school, all with low pupil to teacher ratios .Our staff of 10 includes 4 teachers and support staff. We are proud of our recreational facilities which include four adventure playgrounds, extensive playing fields and school gardens. Our school has a Motto, "Striving High". This motto is what everything Mayfield School is about as we strive high in everything we do and this is an expectation for our students, staff and school community. In 2014 a comprehensive community consultation took place, which resulted in the development of the school's Vision to align ourselves with the new New Zealand Curriculum. This process confirmed our school will concentrate on the basics of Literacy and Numeracy and this will be backed up by implementing an integrated learning approach for our topic areas. As a result you will see classrooms very busy with Literacy and Numeracy during our morning sessions and topic, sport and languages being taught in the afternoons. Our belief is that we need to educate students to be well-rounded people and we provide this with many interesting and authentic learning experiences. We run clubs for six-week blocks for three terms a year and this involves staff, parents and community members sharing their interests and expertise to give the children meaningful and fun learning experiences. Mayfield School is a needs-focused school. We care about our students' needs whether it be socially or academically. We participate in special programmes that allow us to best cater for these needs. We offer a wide variety of sporting and cultural events. These events enhance our classroom programme, build on community spirit and allow children to develop their self-confidence. Local residents regard the school as an integral part of their community and as such offer continuing strong support to the school. Regular school newsletters keep the community in touch with the schools' activities and help maintain this special relationship. The school has a supportive Board of Trustees, an active Home and School Committee and enthusiastic, capable staff. We endeavour to provide a wide variety of learning situations and experiences, and welcome the community into the school to share their skills and assist the staff.